There are quite a number of things you need to keep in mind before you consider to get a septic tank installation. First of all, some states or areas require certain permits before one can be made, while there are those who have certain requirements or standard conditions that need to be met before a household can get their own septic system. I have also heard that installation cost as well as costs related to maintenance can be quite high. However, many people in my neighbourhood are already installing their personal systems due to state rules and regulations. A septic tank is used primarily where there is no connection to the main drainage system pipe provided by the local government. Prior to the installation of a drainage system, there will first be an inspection and assessment of the affected land and area. Septic tank installation cost will probably not cover any costs related to this pre-assessment. The primary requirement is for there to be enough space for the system itself and for the drain field or leach field where the treated water will run off. A typical septic tank can carry about 1000 gal of water, and drainfields are ideally at least four feet deep and a number of meters across. The bigger size of the drainfield helps to avoid drainfield problems which mostly happen when the area has been overfilled. The easiest way to install a septic tank is to avail of the service of the professionals. However, this normally costs at least a thousand dollars or so. If you want to save on the cost of installing your septic system, you can actually read on a free septic tank installation guide that can be found online. There are also some books or other types of articles where such information can be gathered. I would prefer to round up some trusted men and do the installing by ourselves, but just to be sure, I would still prefer experienced professionals to take care of the system. Although septic tanks are usually made of concrete to keep it sealed and airtight, I have heard that there is also the option of using plastic septic tanks. Plastic septic tank installation is said to be easier in some ways, but also quite difficult due to certain factors. Ease comes from the fact that the plastic is a lightweight material that is easy to move and transport. On the other hand, difficulty sets in because the material can also be deformed especially if it is installed in unstable soil. If you want to save on the cost of a septic tank, you can opt for the plastic material, but make sure to consult experts with regards to installation to avoid future problems. 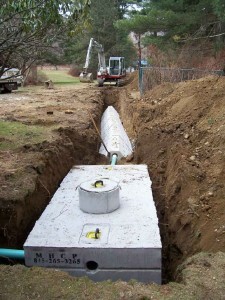 Often involved in the installation of a septic system is the septic tank riser installation. A septic tank riser serves as an extension that brings the lids at level with the surface. This lid replacement can pose additional costs at first, but they can help homeowners save money on costs brought about by maintenance.